The first stage of any Hemmels restoration is to fully strip the car and catalogue each part. This process takes two weeks which the time lapse video captures in just a few moments. The heads of the mechanical and body department take the lead on this process such that any pending problems for the restoration can be discovered and planned for from the very beginning. The restoration process will mean this car will receive many new parts. In this case there are some pulleys and brake components that are obviously in need of replacement. Hemmels has a separate supply chain department which assigns bar codes to all the stripped parts prior to assigning them to dedicated shelving. Each car is given a unique project number and project tag that accompanies the chassis of the car. Not shown in the video is the parallel administrative work where the project numbers are created along with a box file that contains documents that the car has generated over the years. Often the records stretch back to the original time the car was delivered which makes for a comprehensive amount of ownership slips, repair receipts, driver’s manuals, old photos and more. 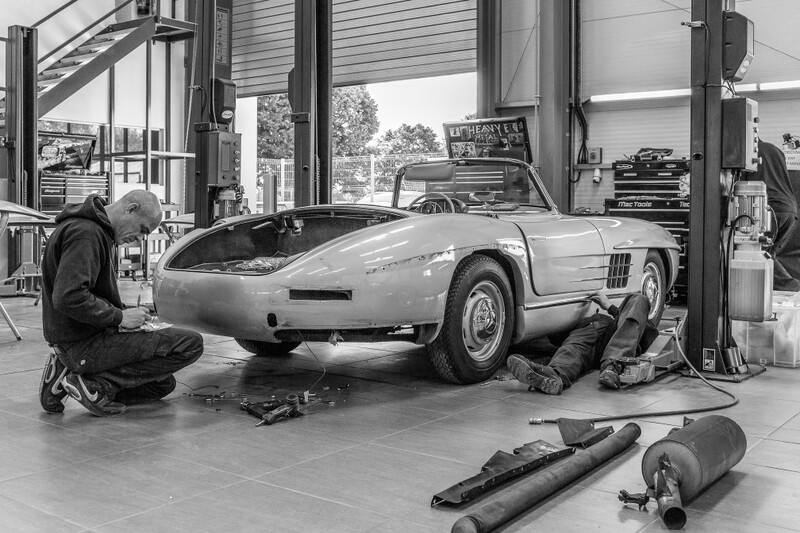 The 300 SL is constructed of a separate body and frame,hence a special rig is required to lift the one-piece shell up such that the chassis can be rolled away. As the 300 SL was borne from a race car, the shell and the chassis were designed to be very light. The shell was fabricated from thin aluminium and steel while the chassis is tubular. It was the tubular design that necessitated the doors being hinged from the roof for the Gullwing, and engineering obstacle ultimately conquered for the Roadster. With the body and shell separated and all parts numbered and stored Hemmels is able to split the restoration process into the separate workstreams for metal work, trim, paint, engine and drive train rebuild and supply chain can all be coordinated by the production manager.